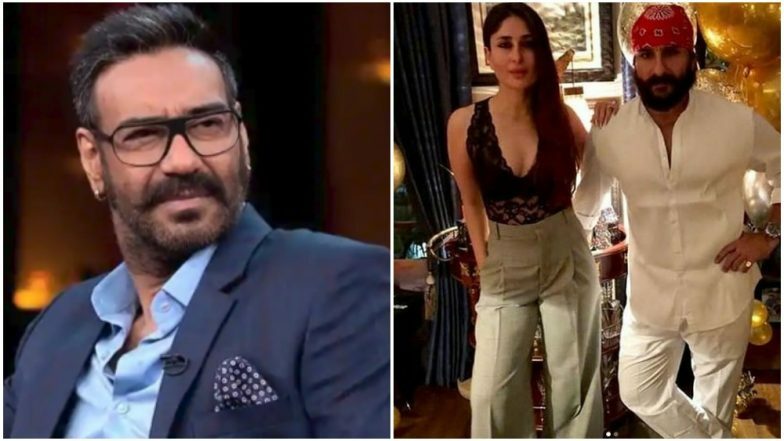 Remember how Ajay Devgn uses Saif Ali Khan and Kareena Kapoor Khan's example in De De Pyaar De trailer to prove that couples with age differences are often successful? While one may think if it ridicules the couple or takes a dig at their relationship, Saif, on the other hand, has no qualms about it. Yes, apparently the actor is fine with his reference and finds it quite amusing. Twitterati was busy making jokes on their mention but the actor and we believe his Begum are all cool with it. Tanushree Dutta Lashes out at Ajay Devgn for Retaining Alok Nath in De De Pyaar De, Calls Him 'Spineless Hypocrite'and 'Morally Bankrupt'. De De Pyaar De revolves around a man in his 50s who falls in love with a girl half his age. Though everything's going fine in their relationship, troubles start arriving when his ex-wife, Tabu and family enter the picture. What follows next is a mad ride and we can't wait to see it on the big screen. De De Pyaar De is slated to release on May 17, 2019.